Softcover. Over a century ago terror stalked the streets of Whitechapel. Jack the Ripper's brutal campaign of murder panicked Victorian London at the time, but his legacy reaches out to the present day. If anything the story of Jack is now more confusing, obscure and mysterious than ever. With each passing generation, new theories and suspects spring up, adding a new page to a legend that has turned Jack from a historical figure into a mythical character who has become a star of folklore, literature and cinema. 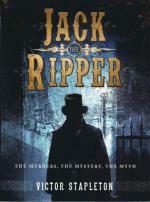 Within these pages the author embarks on a quest to uncover the real tale of Jack the Ripper, retracing his bloody tracks through the foggy alleys of London to finally reveal the true story of Jack the Ripper. Illus. by Darren Tan. 80pp. trade size softcover. Nr. F.